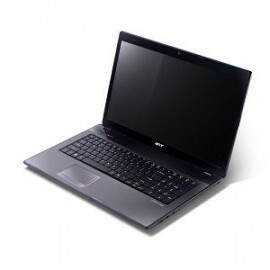 Acer Aspire 7552 Laptop come with Win 7 64-bit, AMD Phenom™ II Quad-Core Mobile Processor N930, 4GB (2/2) DDR3 1066 SDRAM, Providing an excellent blend of performance, size and wireless capability, the Aspire® 7552 is an exciting notebook. Accelerated AMD™ multi-core processing and high-performance graphics provide powerful multitasking and immersive entertainment on the 17.3″ screen. Your favorite fun comes to life on the Aspire® 7552. A cinematic 16:9 aspect ratio and 8ms response time present sharp, bright visuals on the Acer® CineCrystal LED-backlit display. An HDMI™ port lets you hook up to TVs and projectors in full HD for awesome theater-style entertainment. Stay connected via the latest communication technologies, including Acer® Video Conference featuring the Acer® Crystal Eye webcam for quality video chats. The WI-FI CERTIFIED™ network connection lets you get online from any hotspot. In addition, Bluetooth® connectivity makes sharing files super fast and easy. The Aspire® 7552 is both cool-looking and practical. The unique mesh-patterned exterior is not only visually appealing but also protects against smudges and scratches. The Acer® FineTip keyboard features an independent numeric keypad, large keys for comfortable typing plus a multi-gesture touchpad that lets you easily scroll, pinch, rotate and flip through web pages, files and images. *For a free copy of the standard limited warranty end-users should see a reseller where Acer products are sold or write to Acer America Corporation, Warranty Department, P.O. Box 6137, Temple, TX 76503. TFT displays commonly exhibit a small number of discolored dots, so-called “nonconforming pixels.” This phenomenon is a limitation of TFT LCD technology, not a product defect and, as such, is not covered by the limited warranty or by the upgrade programs.